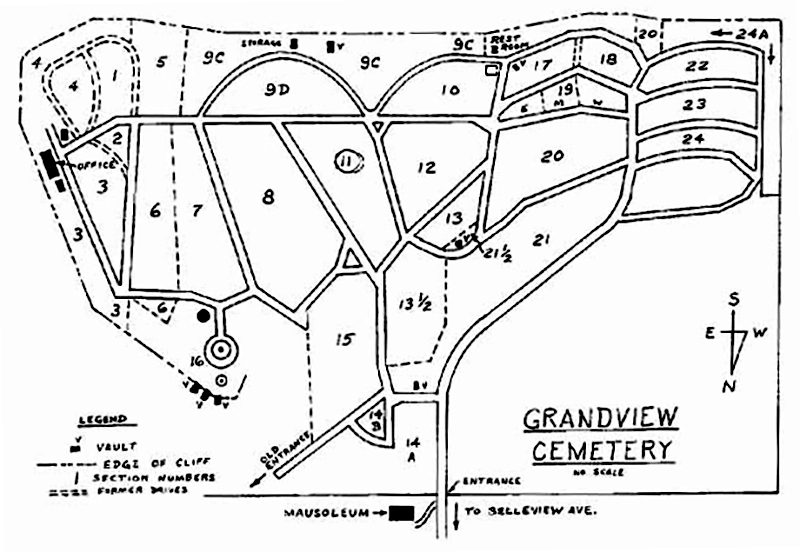 Open from dawn to dusk, Grandview Cemetery was established around 1841 and is approximately 92 acres in size. Because it houses some significant individuals in Ohio history, Grandview Cemetery is a part of the National Registry of Historical Places. Click here for more history on Grandview Cemetery. Click here to search Grandview Cemetery locations. Open from dawn to dusk According to Ross County history books, it was laid out in about 1865 as the “Scioto Township Cemetery.” Previous to that, Greenlawn had been used as a private burial ground. 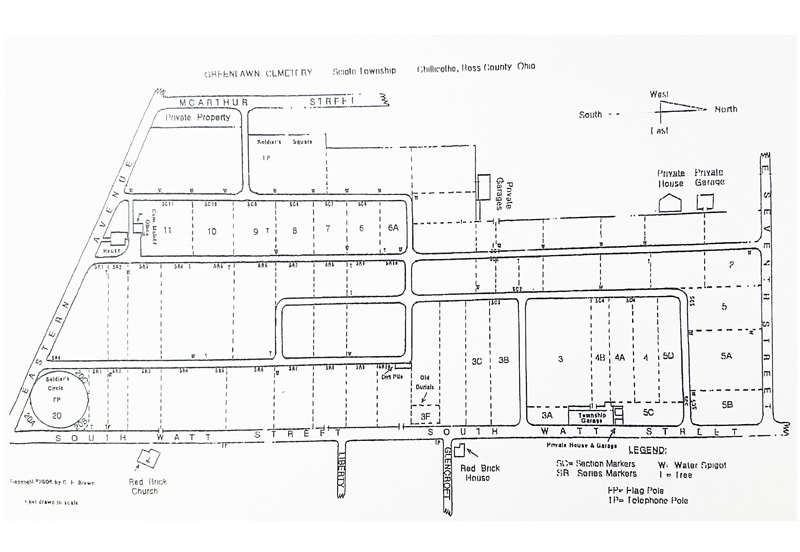 Click here for more history on Greenlawn Cemetery. Click here to search Greenlawn Cemetery locations. All foundations must be installed by Cemetery Personnel. All footstone and military plaques must be installed flush with the ground. All graves must be ground level. If not, the grave will be leveled by the cemetery staff. All statues, fences, and gravel must be within a fence or brick trim. All live plants and flowers must be placed within 24” of the main head stone. Any graves not maintained which have flowers that have been overtaken by grass and weeds will be mowed down and the flowers will not be replaced by the cemetery. Trees and shrubbery must be approved by the supervisor and cannot be intruding on other graves. Artificial flowers are only permitted in the cemetery from November 15th to March 15th. This restriction is necessary as a safety factor for visitors and employees. Flower pots and other ornamentals are permitted as long as they are placed within 24” of the main headstone on the gravesite. Cemetery personnel will not be responsible for ornamental items that are on the grave site. All benches must be kept in monument row. Shepherd rods may only be used for flowers. Only one permitted per interment. The Township Trustees reserve the right to remove any items not covered in the above rules if it deters the beauty of our cemeteries. No use of silicone adhesive is permitted when installing monuments. Use of granite seal setting compound is required. Finished foundation will be a the minimum, the same size as the base of the monument or marker being installed and will not exceed 1 inch above ground level. Finished foundation will not exceed 3 inches on any side of the base or marker being installed. Finished foundation must be located on the property of the lot owner and not exceed. Finished foundation must conform to the finished base or marker size being installed (oblong, square, octagon, oval, round, etc.). Sidewalls will be dug straight down; bottom of the hole will be leveled out to the side and at the center. Finished foundation must not exceed 24 inches from the top or head of the gravesite and must be centered on the grave lot. Military plaques and markers will have the minimum of a 3 inch base of concrete or granite, installed as level to the ground as possible and not to exceed 1 inch above ground level. Finished foundation for all monuments, slants, and bevel markers NOT exceeding 16 inches will be at 12 inches in depth. Finished foundation for monuments, slants, and bevel markers exceeding 16 inches above ground will require a depth of 18 inches below ground at a minimum. Finished foundation will be the responsibility of the installer contracted. Approved fill may be added to the foundation, but not exceed ½ of the finished concrete added. Approved fill: brick, rock, stone, and concrete.